Print Version /// View Warranty InfoQuality is not expensive - it´s priceless, and if you´re running your own business quality is everything. If they´re not working, neither are you. If quality and up time are important to you, then make the smart choice - use a Digga attachment. Such is the build quality of the Digga product that we can afford to offer that extra bit of peace of mind. 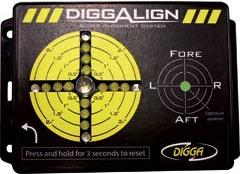 The New Diggalign inclinometer was developed for contractors where accuracy is key. Ideal for drilling, screw piling & core barrelling applications. Designed to show the operator when the top of the pylon/pile/auger is off plumb, and helps to maintain accuracy throughout the installation.